The Kansas State Wildcats host the West Virginia Mountaineers at Bill Snyder Family Stadium on Saturday, November 11, 2017. The opening line for this game has Kansas State as 2.5 point favorites. The Wildcats have an over/under record of 5-4-0 and they are 4-5-0 against the spread. The Mountaineers have an ATS record of 5-4-0 while their over/under record is 6-2-1. 11/05/17 DL Adam Shuler II Undisclosed is "?" 11/04/17 OL Jacob Buccigrossi ACL is "?" 11/04/17 K Mike Molina Hip is "?" 11/04/17 S Toyous Avery Undisclosed is "?" 11/04/17 LB Xavier Preston Undisclosed is "?" 11/05/17 QB Alex Delton Head injured last game, is "?" 11/04/17 QB Jesse Ertz Knee is "?" The West Virginia Mountaineers have run for 1,503 yards as a team, which ranks 62nd in college football. They've run 334 times, averaging 4.5 yards per carry as a rushing unit. The Mountaineers have been penalized on offense 59 times for 616 yards so far this season, which has them 52nd in the country in penalties. They are 10th in the nation in points scored with 362. They have run 685 plays this season for 4,652 yards, which ranks them 6th in Division 1 in total offense. The Mountaineers average 6.8 yards per play, which is 15th in college football. As a team they have accumulated a total of 236 1st downs this year, placing them 9th overall as an offensive unit. Will Grier averages 9.2 yards per pass attempt and 9.6 adjusted yards per throw. He has completed 217 passes on 334 attempts for a completion percentage of 65%. His quarterback rating this year is 165.8. He has thrown for 3,068 yards this season. The Mountaineers rush defense has allowed 367 attempts for 1,738 yards this year, putting them in 98th place in D-1 against the run. West Virginia has committed 68 penalties for 581 yards on the defensive side of the ball this season. That ranks them 101st in college football. They are 88th in the nation in points allowed on defense with 269. They have surrendered a total of 4,032 yards on D, which is 108th in the country. The Mountaineers are ranked 100th in yards per play allowed with 6. Opposing offenses have completed 176 passes on 306 attempts against the West Virginia Mountaineers defense this season, placing them 85th and 100th in Division 1. The West Virginia pass defense has also given up a total of 2,294 yards through the air, which is 99th overall in total pass defense. The West Virginia Mountaineers have attempted 12 field goals this season and made 8, which is 97th in D-1. Their kickers have a field goal percentage of 67%. West Virginia Mountaineers kickers have made 100% of their extra points, going 46 for 46 this year. Their punters have totaled 1,770 yards on 45 punts, averaging 39 yards per punt. That places them 109th in Division 1 in punting average. West Virginia is ranked 38th in the nation in punt returns with 17. They've accumulated 60 punt return yards and average 3.5 yards per return, which is 119th in college football. They have returned 24 kicks for 610 yards on special teams, ranking 40th in kick return yardage. The Mountaineers average 25 yards per kick return and they are 10th in the country in all-purpose yards with 5,323. The Wildcats are 37th in the country in points scored with 297. They have run 541 plays this year for 3,403 yards, which ranks them 99th in Division 1 in total offense. The Kansas State Wildcats average 6.3 yards per play, which is 28th in the nation. As a team they have accumulated a total of 159 1st downs this season, ranking them 112th overall as an offensive unit. On the ground Kansas State has run for 1,741 yards as a unit, which ranks 36th in college football. They've run 349 times, averaging 5 yards per rush as a unit. Kansas State has been penalized on offense 50 times for 429 yards so far this year, which has them 86th in the country in penalties. 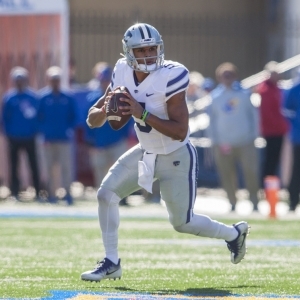 Alex Delton has passed for 585 yards this year. He's completed 42 throws while attempting 75 passes for a completion percentage of 56%. His quarterback rating this season is 125. He averages 7.1 adjusted yards per throw and 7.8 yards per pass attempt. Kansas State is 52nd in the country in points surrendered on defense with 223. They have given up a total of 3,803 yards on D, which is 91st in D-1. The Wildcats are 73rd in yards per play allowed with 5.7. Opponent offenses have completed 223 throws on 357 attempts against the Kansas State defense this season, ranking them 125th and 124th in the nation. The Kansas State Wildcats pass defense has also surrendered a total of 2,662 yards in the air, which is 124th overall in total pass defense. Their rushing defense has given up 315 attempts for 1,141 yards this season, putting them in 26th place in the country against the run. The Wildcats have had 52 penalties for 414 yards on defense this year. That places them 43rd in college football. Kansas State is 23rd in the country in punt returns with 18. They've totaled 243 punt return yards and average 13.5 yards per return, which is 15th in D-1. They have returned 29 kicks for 772 yards on special teams, which puts them 11th in kick return yardage. The Kansas State Wildcats average 27 yards per kick return and they are 48th in the nation in all-purpose yards with 4,418. The Wildcats have tried 21 field goals this year and made 17, which is 5th in college football. Their kickers have a field goal percentage of 81%. Kansas State kickers have made 100% of their extra points, going 34 for 34 this season. Their punters have accumulated 1,608 yards on 37 punts, averaging 44 yards per punt. That ranks them 32nd in the NCAA in punting average.